When I booked The Fable for mine and The Boyfriend’s anniversary dinner I originally hadn’t planned to blog about it, mainly as it wasn’t so long ago that I visited and blogged about another Drake & Morgan restaurant: The Refinery. However as we had such an enjoyable meal and ate some particularly notable things I felt it deserved a mention. We visited The Fable for a late lunch/early dinner on a Sunday and as we were wandering around I did begin to worry slightly that the restaurant might be completely empty, partly due to the odd time we were eating and partly due to the fact that this particular area of the city is pretty dead at the weekend. Despite the deserted streets however, when we arrived there was a bit of life in the dining room as there were a couple of large birthday parties going on. Being a lovely sunny day The Fable was really shown off to it’s best advantage as the large open room with mezzanine balcony, floor to ceiling windows and abundance of foliage, the sunshine almost gave you the feeling of being sat in a nice outdoor terrace. The Fable have a good selection of sharer platters on their menu which make a great sociable starter option or nibbles to share if you’re just there for drinks. Having recently gotten The Boyfriend really into antipasti he was very much up for the idea of sharing one of these for our starter and let me pick which one. 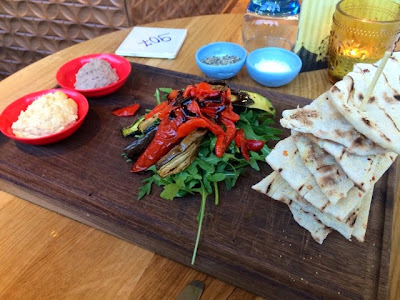 I went for the Mediterranean flatbread which came with houmous, baba ganoush and a salad of rocket with marinated grilled vegetables. The warm flatbreads tasted fresh and were well seasoned though the baba ganoush was a little bland for my taste. I was concerned they might have been a bit skimpy on the dips as it didn’t seem like a huge amount however it turned out to be just the right amount as we were polishing off the dregs with our last flatbreads. I love starters like this, there’s something casual and social about sharing a few nibbles and trying a few different flavours that I really enjoy. 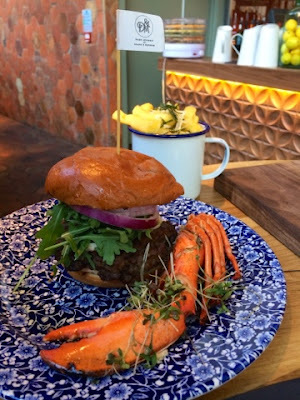 The Boyfriend went for the Lobster and Burger for his main which had lobster meat stuffed into the bun on top of the quarter pounder beef burger and was absolutely enormous. It also came with the lobster claw served up alongside which, as a slightly squeamish eater, did freak him out a bit, whereas I thought it was pretty cool presentation. The Roman fries were his side of choice, with parmesan, truffle and rosemary these were absolutely heavenly and not overly greasy at all. I may have pinched one or two of them. 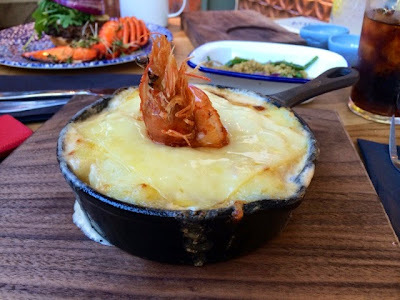 I chose the British Waters Fish Pie which also came quirkily presented with a huge whole prawn nestled comfortable in the centre of it. I pulled him apart and gobbled him up before tackling the main event and he was really meaty and juicy and a really novel way getting the dish going. There was a whole slice of cheese melted onto the top of the pie and whilst I firmly believe that everything is better with cheese, this was a little much for my liking and it would have been slightly easier to break through into the pie if the cheese had been grated on top rather than a solid slab. Delving into the fish pie was like an exciting seafoody lucky dip. I definitely detected some salmon, squid and prawns, I’ve never had squid in a fish pie before so that was a pleasant surprise. Often fish pies can be overly creamy or salty but this dish really let the ingredients take centre stage, the best fish pie I’ve had in a while. 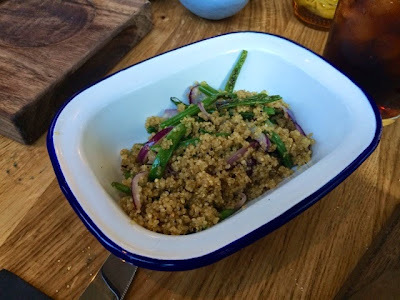 The green beans I ordered as a side, which came with quinoa and capers, was definitely more quinoa than green beans and I don’t recall finding any capers. It was really tasty side dish and very moreish but the description on the menu wasn’t very accurate. Dessert was a flourless chocolate brownie with vanilla bean ice cream. 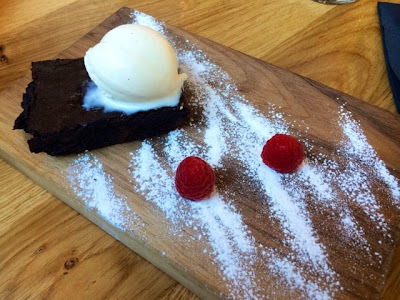 You can’t really go wrong with a nice warm gooey chocolate brownie with ice cream, what was nice about this one was, firstly, that it was a gluten free option and it’s nice to see restaurants catering for that, and secondly that being flourless it was a little lighter. When I booked The Fable for our anniversary dinner, I was a bit concerned that it’d be exactly the same as my experience at The Refinery, however despite the menu being the same it felt like trying another totally new restaurant and doesn’t feel chain like at all. Having enjoyed my meal at both establishments and enjoyed both the relaxed and social atmosphere I’d happily recommend visit to any of the Drake & Morgan restaurants as their formula seems to be working well.